Image of mega berg calving of the Jakobshavn Glacier (Ilullisat Glacier) in Greenland. The same process happens in Antarctica, and it is rapidly increasing. Image: screenshot from Jason Amundson, University of Fairbanks. See video here. Sea level rise estimates of around 10 feet by 2100 are now becoming hard to ignore. This article is about several new findings in 2018 that build on near-10 feet of sea level rise news from NOAA in 2016 and 2017. What is probably the most important climate change impact, with the highest risk of near-term civilization disruption, is sea level rise from ice sheet collapse. Modeling is not yet yet mature, that recreates ice sheet collapse robustly enough to be included in IPCC reporting. This is why there is such a disparity between the Intergovernmental Panel on Climate Change (IPCC) reporting of two feet of sea level rise by 2100 and much higher numbers from leading science. The science has to be well-developed to be included in IPCC reporting. Evidence from prehistory counts, and it is this new evidence gathered over the last ten years that is working itself into consensus projections, but slowly. Science is slow. Too slow for climate change. We can deal with a little more warming (maybe), and weather catastrophes still only kill a few (relative to the entire populations,) but abrupt sea level rise greater than the consensus estimates of about 2 feet by 2100 will compromise what is likely a majority of our global infrastructure located on our shorelines. Because the limits of sea level rise adaptability are about three feet per century (reference 15A), compromise of near-shore infrastructure has a distinct possibility of creating economic conditions unlike anything we have experienced. 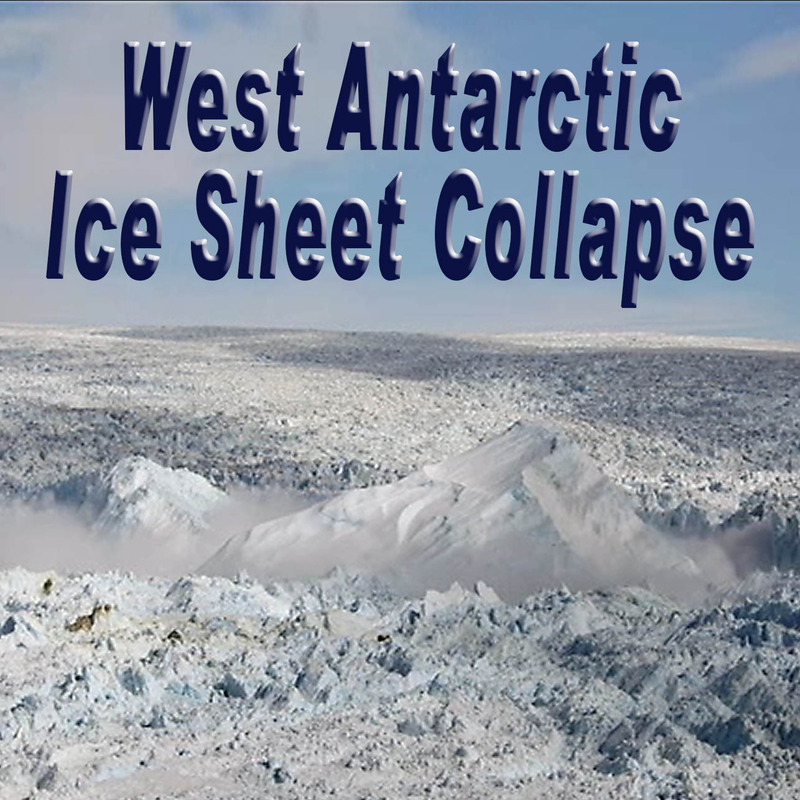 Collapse initiation of the West Antarctic Ice Sheet has been suggested for about a decade now. We know of ice sheets collapse from abrupt sea level rise in prehistory of 10 to 20 feet per century (reference 12). Current science understands that most abrupt sea level rise comes from Antarctica. Processes in Antarctica are very similar to Greenland where the video below was made. The above video is by Jason Amundson, Martin Truffer and Mark Fahnestock of the University of Alaska Fairbanks from the Jakobshavn Glacier at the Ilulissat Ice Fjord World Heritage Site. See the Google Earth Satellite Images of the Jakobshavn Glacier. New research findings from the University of California Institute of Technology by Eric Rignot and his team has found that contrary to the vast majority of findings, Antarctica has been losing ice since the 1970s. As recently as the 2007 IPCC report, Antarctica was supposed to continue to gain ice until at least 2100. This new work by Eric Rignot and his team combines all of the available data from previous findings to reanalyze the actual extents of the prehistoric ice sheet. A much more dangerous picture of ice sheet collapse is now emerging. What Rignot et al., found was that since 1979, Antarctic ice loss has increased six-fold, by 600 percent. Most of the increase has happened recently and it is accelerating at 280 percent per decade. Complimenting Rignot’s work in 2018 is Anders Carlson and his team at Oregon State University. Their work was first presented at the American Geophysical Union annual conference in December and reveals evidence of 8.2 feet of sea level rise per century about 125,000 years ago when Earth’s temperature was about the same as today. They looked at ocean sediments around Antarctica to determine the extents of the ice sheet edge in the past. How this works is that bed scour, or the bulldozing action of a glacier or ice sheet, picks up rock and sediments and carries them along until the ice is discharged as icebergs. These icebergs float away and melt and their load of sediment then falls to the ocean floor. It’s this transported rock and sediment that tells the story. When an ice sheet disintegrates, it’s sediment load origin changes. Once we know the composition of ocean sediments, we can trace the origin of these sediments back in time. What Anders has found is that sediments originating beneath the West Antarctic Ice Sheet disappeared 125,000 years ago, meaning the West Antarctic Ice Sheet disappeared too. An interglacial warm period is the Goldilocks climate we are experiencing today. We have these warm periods about every 100,000 years because of natural climate change caused by the Earth’s rotation around the sun and Earth feedback responses to changing incoming heat from the sun. The interglacial warm periods are about 6 to 7 degree C warmer than the 100,000 year long ice age pulses, and in our current state of Earth orbital cycles, we have had 10 of these ice ages in the last million years. This critical information is doubly important when one considers the rate Earth is warming. During our last interglacial warm period, the warming rate was nowhere near the warming rate today. This could plausible mean that ice sheet collapse today, once fully initiated, could proceed far faster than in ancient times. Clark et al. in 2016 say Earth is warming 40 times faster than the warming rate we experienced when we were warming out of the last ice age, 125,000 years ago. Rignot et al., Four decades of Antarctic Ice Sheet mass balance from 1979–2017, PNAS, January 14, 2019. Voosen commentary on Carlson, Antarctic ice Melt 125,000 years ago offers warning, Nature Climate Change, December 21, 2018. Clark et al., Consequences of twenty-ﬁrst-century policy for multi-millennial climate and sea-level change, Nature Climate Change, February 8, 2016.